Lovely Van Briggle art pottery piece. Oak leaves and acorns pattern. Excellent condition - no scratches, chips or cracks. Clearly marked "Van Briggle Colorado Springs"
Bowl measures 6 inches at its widest (oval) and is about 4 inches high. The color is a dark dusky rose with a dusting of blue over the leaves. I have heard this color is called Persian Rose". Or it could be Mulberry but it appears to be too dark to fit that color description. 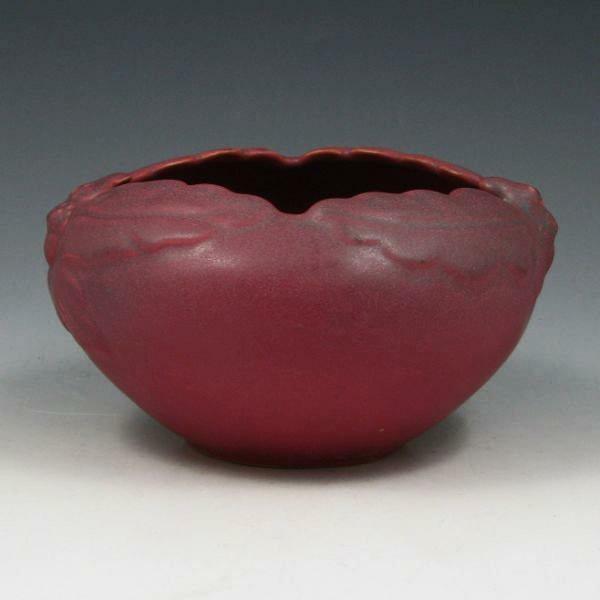 Items Similar To "VAN BRIGGLE POTTERY BOWL - ACORN & OAK LEAVES"